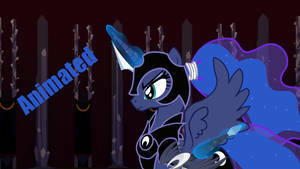 The "Come hither Luna skin" for MLP art for the sake of it. Quick pic for CeeCee in the stream. (Sorry, forgot your FA/DA name) >_< Thank you for buying a pic. About an hour, with some extra minutes here or there for forgetting her wings the first time. Let me start off by saying I love your work! Okay down to business, First off I love the dark colors you used with this picture and the beams of light going through the wings and body make the picture that much more epic. The shadowing is stellar and the color scheme is really appealing to the eye! I really like how you made her wings, very artistic and unique as well as the hair (mane if you are that guy) looks like it was the most difficult to pull off. Over all I can say that this picture is really well done and I hope to see more like this in the future! 20 out of 21 deviants thought this was fair. Just seeing if this refreshes the favourite on your account. I'd forgotten I'd already made a comment on it. I don't know exactly what it is that makes me like it so; but there's something, or several somethings about this picture that are causing me to add it to my favourites. Also, as I was writing this comment the phrase "stellar work" came to mind when I was thinking about how you've done the hair. I didn't even intend on making any puns, but it's too good to not mention.